So you want to make like Anthony LaPaglia and leave us without a trace? If you don't want to lose your data, just cancel your subscription instead. All your data we be retained in case you choose to return to Timely at a later date. It's not good-bye forever, you're just taking a break. Account deletion can only be accessed by account owners. Not sure if you're the account owner? Head over to Settings > Global and scroll down past the 'Update Settings' options. As the owner of the Timely account, you'll see the option to transfer ownership of your Timely account (e.g. if you're leaving the company) or delete the account completely. Just beware: deleting your account will permanently delete the data on your entire account, and we won't be able to retrieve it once it's gone. Once you start the delete my account process, you'll be prompted to complete an exit survey. Your feedback really helps us improve and we really appreciate you taking the time to complete the survey. Feedback submitted, then click on the "Proceed with cancellation" button to cancel and delete your account. One last check before you delete your account...forever! Once you've deleted your account, you'll still be able to sign in with the same username and password, but your email will no longer be linked to a Timely account. Note: If you are linked to other accounts in Timely with the same email address, you'll still be able to log in. The account delete process only applies to the specific account you're logged into at the time of deleting. When you choose to delete your account, your account data is erased from Timely. 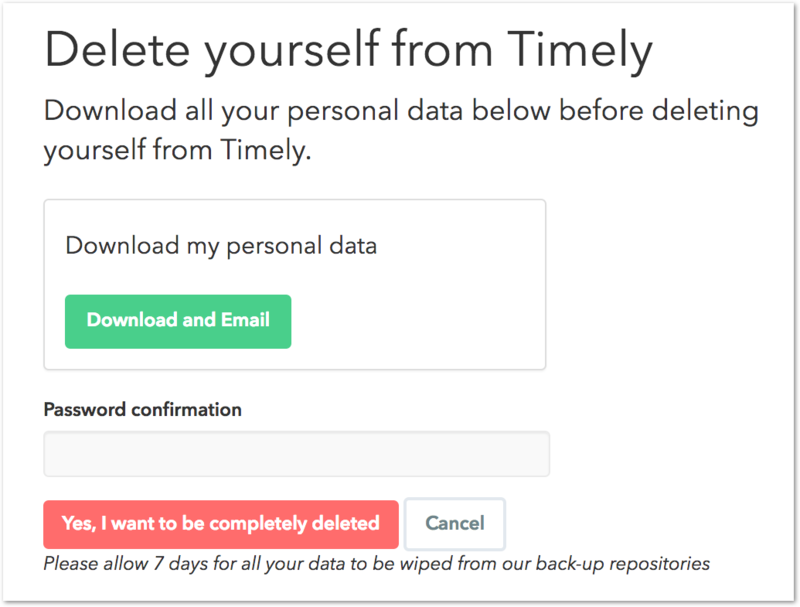 If you ever need to come back to Timely you can sign in with your username and password and create a new account, super-duper easy! Once your account is deleted, you can then opt to delete your user information as well. You also have the option to download the personal data linked to that email account. Once you're ready, confirm your password and click the red button. Your personal data will be wiped from Timely within 7 days.